I met this woman early one morning last summer at the Starbucks near our office. 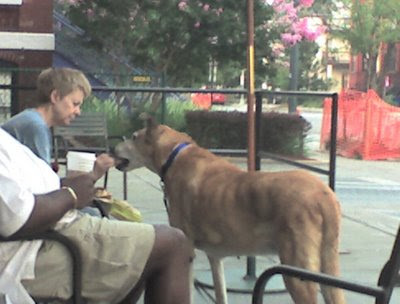 She walked up with her huge, hobbling dog, handed me the leash, went inside, came back out a few minutes later, and fed him a maple scone. She told me that he is seventeen years old and loves scones, so she gets him one every day. "At his age, he can have whatever he wants," she told me. I have not seen her recently and wonder whether her dog has died.